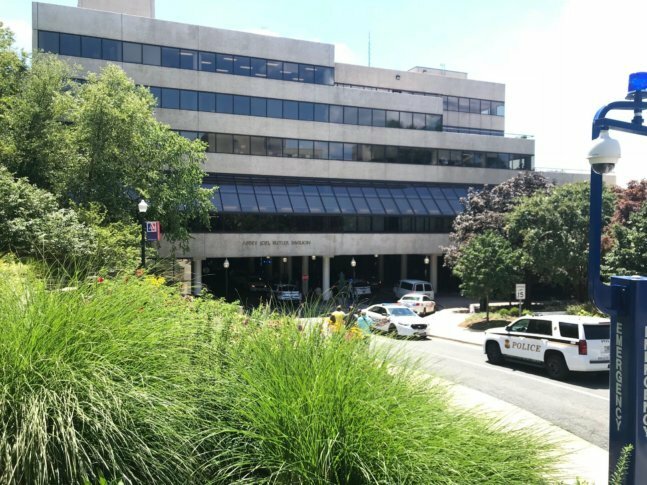 WASHINGTON — American University was on lockdown for more than three hours on Wednesday afternoon as police investigated a report of an armed intruder near campus. The university said in a statement that at about 1:10 p.m., D.C. police relayed a report of a man carrying a handgun in the nearby 3300 block of New Mexico Avenue, prompting the American University police to initiate a lockdown “out of an abundance of caution.” Over the next several hours, the Metropolitan Police Department and the U.S. Secret Service joined campus police in conducting a building-by-building sweep to ensure public safety. Texts and emails sent via the university’s alert system shortly before 1:30 advised those on campus to lock doors and stay away from windows, and directed anyone outdoors to leave campus immediately. Campus police said in a tweet that technical difficulties initially delayed email alerts for some. The lockdown was extensive, at first including all of American University’s campuses and many of its associated buildings in Northwest D.C. — although the investigation itself concentrated on AU’s main campus near Tenleytown and an administrative building on New Mexico Avenue. Shortly after 4:30 p.m., American University police gave the all-clear after determining there was no threat to the AU community. “Our number one priority is the safety and well-being of those in our community and exercising a high degree of caution is paramount,” the university said in an updated statement following the end of the lockdown. As of Wednesday evening, law enforcement were still working to identify the man supposedly carrying the handgun. Caught in the lockdown were about 120 children as young as 6 participating in the Jr. Wizards Summer Basketball Camp at AU’s Bender Arena. In what they had been told was a fire drill, the kids safely hid inside locker rooms together with staff, and ultimately reunited with worried parents at the nearby National United Methodist Church. Editor’s Note: This story has been corrected to clarify the subject of the law enforcement search.